Musical Ecologies continues Friday May 29th with a special event celebrating the release of Beth O’Brien and Craig Shepard’s new book On Foot: Brooklyn (Blank Foot Press, Wandelweiser Series #4). The book documents a three-month period (February 21 to May 21, 2014) during which Shepard traveled solely on foot throughout New York City. 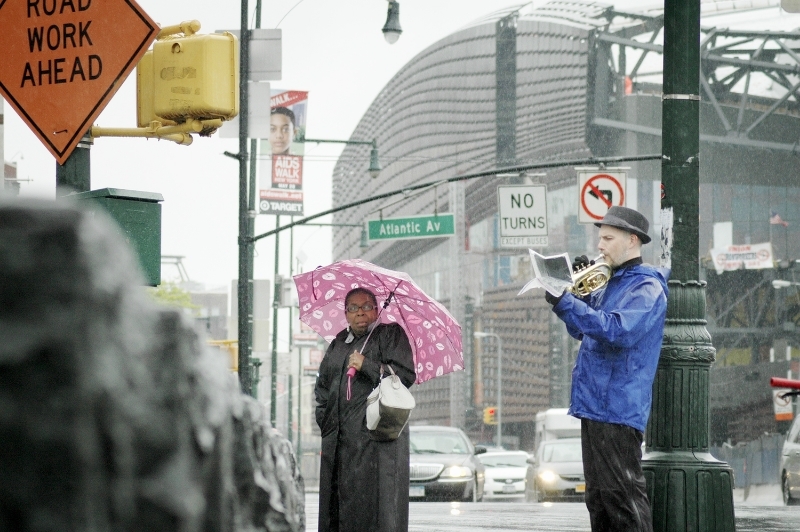 As part of the project, he composed a new piece each week which he performed on Sunday at the endpoint of a silent, cell-phone-free walk he led from Greenpoint, Brooklyn to a different outdoor public space in Brooklyn. O’Brien accompanied him every Sunday on bike photographing along the routes he walked, which covered much of Brooklyn. Her images capture moments of quiet and solitude within a colorful and sometimes crumbling landscape, conveying a sense of vastness and diversity that may surprise those who have not traversed Brooklyn on foot. The resulting book combines these images with Shepard’s writings on a range of topics related to the project including silence, sound and listening. The evening will include a conversation between the artists and series curator Dan Joseph, and will culminate in a multi-media performance by the artists based on the project. The event will also coincide with an exhibition of O’Brien’s photography in the Great Room of the Old Stone House that will run from May 29th to June 21st. Beth O’Brien has never lost her wonder at how the world is both captured and transformed in photography. Through an iterant childhood marked by a steady stream of museum visits, she developed both a highly observant nature and a love of formal composition. Her carefully framed photographs can transform the most prosaic street scene into a complex composition of color, texture, light and forms while poignantly capturing the quiet moments of human existence. Craig Shepard (composer, trombone) makes music related to stillness. A longtime member of the Wandelweiser network, he grew up in Connecticut where he would go for long walks in the middle of snowy nights, stopping to listen to the sheen of millions of snowflakes hitting the ground. He wants to share this connection with sound. Recent projects include Trumpet City and the Music for Contemplation Series in Williamsburg, Brooklyn. Comments closed — Trackbacks closed RSS 2.0 feed for these comments This entry (permalink) was posted on Friday, May 8, 2015, at 1:17 pm by Dan Joseph. Filed in press release.